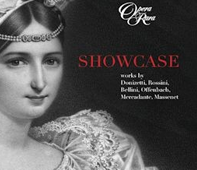 Showcase – a limited edition disc available exclusively from Opera Rara. 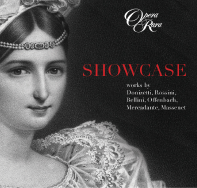 Opera Rara showcases highlights from its recent and forthcoming recordings on one disc with excerpts from works by Donizetti, Rossini, Bellini, Offenbach, Mercadante and Massenet. Operas featured include Aureliano in Palmira, Caterina Cornaro, I Normanni a Parigi, Il pirata, Vert-Vert, Le Portrait de Manon, Linda di Chamounix and Maria di Rohan with ‘Toast pour le nouvel an’ from the Rossini Songs album and yet to be released excerpts from Donizetti’s Belisario and Rita. By purchasing this beautifully presented recording at the special price of £20.00 for the CD and £7.49 & £10.00 (MP3, FLAC & ALAC) for the download you will be helping to secure Opera Rara’s future as £10 from every purchase will be used to create future recordings and for UK tax payers your £10 will be matched via our Arts Council of England Catalyst Arts Grant so it will become £20. Silvia Tro Santafe, Carmen Giannattasio, Colin Lee, Barry banks, Aled Hall, Graeme Broadbent, Jose Bros, Ludovic Tezier, Mark Le Brocq, Brindley Sherratt, Victoria Simmonds, Jennifer Larmore, Toby Spence, Christopher Maltman, Hanna Hipp, Pablo Bemsch, Susana Gaspar, Nicola Alaimo, Russell Thomas, glise Gutierrez, Krassimira Stoyanova, Christopher Purves, Riccardo Simonetti, Geoffrey Mitchell Choir. Conductors - David, Parry, Maurizio Benini, Stuart Stratford, Sir Mark Elder. 09 Linda di Chamounix: Presti! Al tempio!